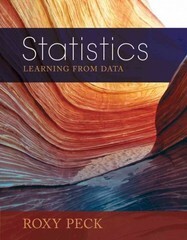 Statistics 1 Edition STATISTICS: LEARNING FROM DATA, by respected and successful author Roxy Peck, resolves common problems faced by learners of elementary statistics with an innovative approach. Peck tackles the areas learners struggle with most--probability, hypothesis testing, and selecting an appropriate method of analysis--unlike any book on the market. Probability coverage is based on current research that shows how users best learn the subject. Two unique chapters, one on statistical inference and another on learning from experiment data, address two common areas of confusion: choosing a particular inference method and using inference methods with experimental data. Supported by learning objectives, real-data examples and exercises, and technology notes, this brand new book guides readers in gaining conceptual understanding, mechanical proficiency, and the ability to put knowledge into practice.